How do I navigate and login to Blackboard? You can get to it directly by typing http://blackboard.noctrl.edu into your browser window. You can also click on the Blackboard icon that appears on the North Central College home page. In addition, there is also a link on the front page of the ITS website. The login information is the same as your Webmail and Merlin logins. Why am I unable to see my class in Blackboard? If you can't see a particular class, this generally means that the instructor hasn't chosen to make the Blackboard course available to students. Not all instructors use Blackboard. Contact the instructor if you are unable to view your class in Blackboard. How do I install BB Student - Blackboard's mobile app? Blackboard offers a free mobile app specifically designed for students called "BB Student." This app is available for iOS, Android and Windows mobile devices (see links below). This app allows students to interact with courses, instructors, classmates and contents. What features does this app offer? Activity Stream - The default screen that will be displayed after you are logged into the mobile app. Activity Stream shows up-to-date course content and reminders about actions you need to take. This feature automatically prioritizes events to help you focus on what needs to be done right away. Courses - You will have access to all of your courses, past, present and future - grouped by term. Simply tap on a course to view its contents and assignments. Grades - Real-time access to your overall grade for each course. 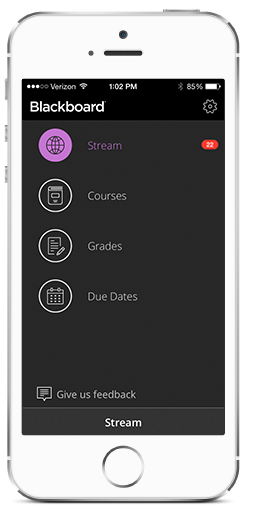 Tap on the course to see a breakdown of scores on assignments, tests and quizzes. Due Dates - You can quickly see what is due so you can prioritize your tasks. Work is color coded by course and grouped by day and week. * Tests and assignments only show if your instructor has specified a due date. Launch the app and when prompted to search for your institution, type "North Central College"
What if I have a problem or question about Blackboard? If you have a problem or question about a specific course on Blackboard, talk with your instructor. If you have a technical or general question about Blackboard, please email or call the Help Desk, at extension 5440. How do I get added to my Blackboard courses? All Blackboard course rosters are updated automatically according to a student's course enrollment on record with the Office of the Registrar. When I try to log in, I get the error message "An error occurred while the system was processing this login request." The most likely reason for getting this error message is an incorrect username or password. If you have forgotten your password, you can reset it using the password reset. My Blackboard is cluttered with courses, and it's really confusing! What can I do?